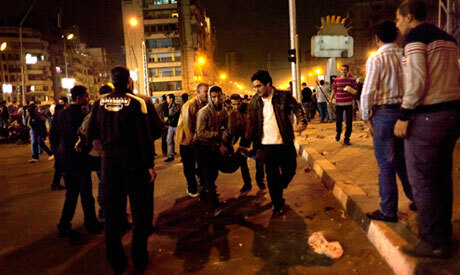 Ahram Online provided live coverage of the events on Wednesday night. 23:20 Bloody clashes near the presidential palace are still on and off, gunshots heard intermittently, at least 126 injured in the bloody confrontations and unconfirmed reports of two deaths, while President Morsi and the presidential office have yet to comment on the ongoing turmoil. 23:15 500 anti-Mori protesters chant against the Muslim Brotherhood at its national headquarters in Mokattam. 23:10 Zaghloul El-Balshi, the general secretary of the constitution referendum supreme committee, resigned on Wednesday following the clashes that erupted between supporters and opponents of president Mohamed Morsi. 22:30 Ahram Online's Osman El-Sharnoubi says hundreds of anti-Morsi protesters and pro-Morsi supporters are debating the ongoing political crisis in small circles, in the nearby Salah Salem Boulevard. "The environment is friendly here," El-Sharnoubi added. Toner argued that the referendum set to take place on 15 December should be held peacefully and monitored by “neutral observers,” adding that it was important for Egyptians “to express their views in a peaceful manner”, and to be allowed to protest peacefully. 22:10 The Revolutionary Socialists have said that one of its members was killed by Muslim Brotherhood supporters during clashes today. 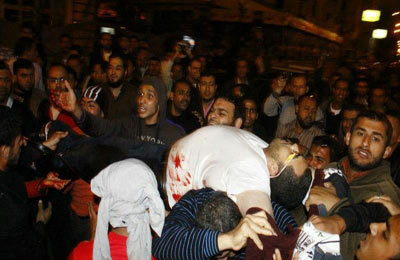 “We are mourning the death of Taha Magdy, who was killed by Brotherhood thugs. We are ready to offer hundreds of martyrs for the sake of our revolution,” the group said on their Facebook page. 22:05 The Freedom and Justice Party headquarters in Ismailia in north-east Egypt have been set on fire, reports Reuters. 22:00 Breaking the government's silence since the beginning of Wednesday’s clashes, Prime Minister Hesham Qandil in an official statement called on all forces to halt the violence and to open space for negotiations. "Efforts need to be exerted to get out of the current political crisis," he said. 21:57 Ahram Online’s Ahmed Feteha reports that protester Mahmoud Nabil, 24, claimed that his arm was broken in an assault by pro-Morsi supporters. "He said that he approached a bearded man supporting President Morsi and told him that what he and his colleagues were doing is unacceptable," Feteha said. "The bearded man, according to the victim, threw him on the ground, and then another man used a hammer to break his arm." 21:55 Ahram Online's Osman El-Sharnoubi says that in Merghany Street, close to the palace, clashes have stopped for now. Morsi supporters have withdrawn from the street. Two buses and a car with Morsi banners have been destroyed by anti-Morsi protesters. 21:50 Hundreds of anti-Morsi protesters in the coastal city of Alexandria marched from Victor Emmanuel Square in the Smouha district to Sidi Gaber Square, stopping traffic in the main streets of the city, Al-Ahram’s Arabic website reports. He also claimed that former regime allies including former presidential candidate Ahmed Shafiq, television host Tawfiq Okasha, former MP Mohamed Abou-Hamed, head of the Constitution Party Mohamed ElBaradei, and former presidential candidate Amr Moussa, "are responsible for the ongoing bloodshed." 21:45 Central Security Forces are firing tear gas canisters reportedly to disperse clashes in Kahlifa El-Maamoun Street, close to the presidential palace, with the aim of creating a buffer. Two CSF trucks are now parked between the two rival groups and clashes have stopped. 21:40 Al Jazeera reports that Egypt’s Ambulance Authority has reiterated its earlier statement that no deaths have been reported thus far, although the injury toll has risen to 126. 21:35 British Foreign Secretary William Hague has issued a statement calling on all factions in Egypt’s conflict to refrain from using violence, and stated that the British government is communicating with both the ruling power and the opposition. “The British government expresses its commitment to aid in the process of Egypt’s political transition and the promotion of democracy,” read the statement. 21:30 The Central Security Forces, Ahram Online’s Ahmed Feteha reports, are trying to disperse anti-Morsi protesters in Roxy Square with tear gas. "Meanwhile, protesters have attacked a police kiosk set up in the area," he added. 21:25 Dozens demonstrate in front of the Muslim Brotherhood’s Freedom and Justice Party headquarters in Suez City, protesting what they described as a Brotherhood assault on the sit-in at the presidential palace, reported state agency MENA. Security forces are surrounding the headquarters. 21:22 Ahram Online reporter Ahmed Feteha spots a man using a firearm against the Brotherhood supporters. "It seems he is not adept at using firearms, but he has been using it recklessly," Feteha says. 21:20 Moderate Islamist Wasat Party leader and Constituent Assembly member Essam Sultan speaking on Al-Jazeera Mubasher Egypt television channel puts the blame on Mohamed ElBaradei for the bloody clashes that have ensued outside the presidential palace. 21:15 Salafist preacher and Morsi supporter Yasser Borhami tells Al-Jazeera satellite television channel that "the ongoing violence does not serve the country," and adds that what is happening today started yesterday when protesters besieged the palace "saying words that were insulting to the president." “If you are capable of using violence there will be others who are capable of responding with violence,” the head of the ultra-conservative Salafist Call argued. “If you say that the constitution is not consensual then say your comment and we will listen." "I was in contact with members of the non-Islamist camp and I told them that we have to protect the presidency,” he added. He reports that crowds are currently outside the National Security Directorate in Damietta city, and have blockaded the main road with burning tires, chanting against Morsi. 21:08 The Ministry of Health says the injury toll has risen to 63, with no deaths reported so far. 21:05 Al-Ahram Arabic news website reports that three men were detained and handed over to security authorities in Zagazig city in the Sharqiya governorate for setting fire to the local Muslim Brotherhood headquarters, as well as two cars parked outside the building. "The anti-Morsi protesters, also in the hundreds, are facing the opposite direction. No violence currently as both sides keep chanting. 'The people endorse the president's decision,' is repeated by the Brotherhood's supporters, while protesters on the other side chant 'The people want the fall of the regime,' among other slogans. Clashes in the surrounding areas have been back and forth. “Shame on all of us for contributing to the collapse of the homeland,” he commented. Shaheen also said that all factions of the political elite are responsible for the current crisis, and urged dialogue between them. 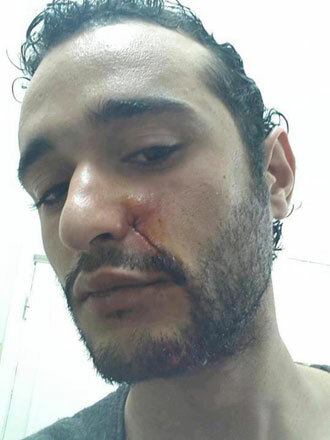 20:43 Political activist Ahmed Douma, who was detained during the 2011 Cabinet clashes, is pictured on Facebook with a bloodied knife wound to his face. 20:40 Bedaya news website claims that its reporter, Osama El-Shazly, has been wounded by birdshot pellets shot by the Morsi supporters’ side. 20:30 The Ministry of Health says there have been no reports of deaths so far as a result of the ongoing clashes at the presidential palace in Cairo, according to the state-run news agency MENA. The ministry also announced that the injury toll has reached 13, in addition to five more who were hurt in other confrontations in downtown Cairo’s Tahrir Square. 20:20 The Freedom and Justice Party’s official website claims a Muslim Brotherhood member, Mohamed Assem, has just been killed by live ammunition. 20:15 "The president, the presidential office and the group [the Muslim Brotherhood] are fully responsible for the violence before the Ittihadia [palace]. The Brotherhood's way to manage crises: Violence, fascism and failure," political analyst and former MP Amr Hamzawy says on Twitter. "The legitimacy of the president is not at stake, it's falling now." “To the president, the presidency and presidential aides, after your shameful performance we do not trust you and we do not trust your management of the country,” he said. The former head of the Judges' Club calls on leading groups to discourage the use of violence by youth, and calls for a consensus-building initiative by Constituent Assembly members and the National Salvation Front to negotiate ways forward. “The president, however, has to freeze the draft constitution,” he asserts. 19:56 Presidential aide Ayman El-Sayyad announces his resignation as clashes continue near presidential palace. “Egypt is bigger than a narrow-minded elite. Egypt will continue its revolution”. 19:52 Ahram Online reporter Ahmed Feteha says that anti-Morsi protesters are adopting a highly offensive stance towards the Brotherhood, having spotted demonstrators destroying a car of a man in Roxy Square near the palace, because he had displayed the logo of the Freedom and Justice Party. They did not assault the man, however. 19:50 Anti-Morsi protesters repeatedly chant “Jika”, the name of the protester killed during clashes with police near Tahrir Square two weeks earlier, considering him to be the first to have been killed at the hands of security forces since President Mohamed Morsi won the elections. “The people want the fall of the regime,” is another chant frequently heard. 19:47 As security forces enter the site of clashes outside the presidential palace, crowds are heard chanting, “One hand,” in an attempt to subdue violence. 19:43 The official Freedom and Justice Party website claims that a Muslim Brotherhood supporter has been seriously injured outside the presidential palace as a result of live ammunition. 19:41 "We will not agree to participate in any dialogue until the constitutional declaration is annulled," ElBaradei says at the ongoing press conference. 19:40 Head of the Democratic Front Party Osama El-Ghazali Harb, speaking at the National Salvation Front press conference, denounces the "Islamist militias" for attacking peaceful protesters. 19:35 Mohamed Sultan, head of Egypt’s Ambulance Authority, said that 11 people have been injured so far in the clashes which erupted in front of the presidential palace. 19:31 Ahram Online reporter at the scene, Osman El-Sharnoubi, says that a big anti-Morsi march has just arrived on the other side of the presidential palace. 19:30 The Sabbahi Campaign Twitter account says member of the Egyptian Popular Alliance Mirna Emad has been killed during the ongoing clashes. The April 6 Youth Movement coordinator and member of the Constitution Party Diaa Samir was shot in the eye by birdshot pellets although this is yet to be confirmed. 19:29 Hamdeen Sabbahi, at the National Salvation Front press conference, says that the president, who the people elected, is quickly losing his legitimacy. 19:25 According to Ahram Online reporter Ahmed Feteha, who is at the scene, Muslim Brotherhood supporters attacked anti-Morsi protesters in the vicinity of the presidential palace, firing birdshot pellets. Petrol bombs are also being thrown by both sides. "The Brotherhood supporters outnumber their opponents," Feteha comments. 19:20 Mohamed ElBaradei at a National Salvation Front press conference that is underway commented: "The current regime is as oppressive as the former regime...our movement is peaceful and will carry on." 19:15 According to ONTV satellite channel the Ministry of Interior has announced that Central Security Forces are trying to create a buffer-zone between presidential supporters and opponents clashing around the presidential palace. 19:00 Molotov cocktails fly around the presidential palace, fireworks light up the sky and gunshots were heard as clashes flared up minutes before 7pm at the presidential palace in Cairo on Wednesday between supporters of President Mohamed Morsi and his opponents, who had been holding a protest sit-in at the site since Tuesday night. Clashes broke out at the presidential palace in Heliopolis, Cairo, between supporters and opponents of President Mohamed Morsi at around 4pm. According to media reports, there was no security presence at the palace when the clashes began. The Muslim Brotherhood claimed there have been calls by the opposition to attack and break into Egypt's presidential palace, amid the tense, ongoing protests against President Mohamed Morsi. "Such calls waste the legitimacy and ignore the existence of the state president, who was elected by the people," reads a statement of the Islamic group, from which Morsi hails, on its official site. An Ahram Online reporter at the scene, Osman El-Sharnoubi, confirmed that clashes have continued between Morsi supporters and anti-Morsi protesters in several side streets by the presidential palace. Shortly before 6pm, Central Security Forces appeared on the scene for the first time since the clashes began and have acted to stand as a barrier between the warring sides. Eyewitnesses told Ahram Online that several thousand pro-Morsi supporters arrived at the presidential palace minutes before 4pm where they attacked dozens of activists who had been holding a peaceful sit-in since Tuesday. Earlier in the day, a leading Muslim Brotherhood member told Ahram Online that the group planned to hold a pro-Morsi demonstration in front of the presidential palace. Asked whether such a step might not result in clashes between Brotherhood members and the opposition protesters sitting in at the site, he replied, "let what may happen, happen." Activist Aida El-Kashef told Ahram Online that demonstrators staging the sit-in had created a buffer-zone to avoid clashes with approaching rival Morsi loyalists. The peace was not maintained for long, however, as a throng made up of hundreds of Morsi supporters approached and attacked the tents of anti-Morsi activists. El-Sharnoubi reports that pro-Morsi protesters hauled the remains of the tents they had destroyed away from the site of the palace, shouting, "We're cleansing the palace." Activist Nawara Negm reported that she had been attacked together with activist Rasha Azab by supporters of the president. In response, Mohamed ElBaradei condemned the violence on Twitter, saying, "Vicious attack vs peaceful protesters in front of presidential palace without police protection. Regime leading Egypt into violence & bloodshed." Meanwhile, the numbers of pro-Morsi supporters have been increasing outside the palace. A small truck accompanied the pro-Morsi demonstrators, mounted on which were loud-speakers calling on people to vote for the new constitution and carrying a banner reading "Yes to the constitution." "The people support the president's decisions" and "Long live President Morsi; the martyrs' blood was not shed in vain," the pro-Morsi loyalists chanted. A few opposition protesters could still be seen standing nearby, although clashes appear to have subsided. The atmosphere, however, remains tense with limited scuffles breaking out intermittently. Ambulances have arrived at the scene in anticipation of possible injuries. Pro-Morsi supporters could be seen wiping anti-Morsi graffiti off the palace's walls. On Tuesday, hundreds of thousands of protesters marched on the presidential palace to denounce Morsi's constitutional declaration and what they felt was an "authoritarian" draft constitution. The Brotherhood has released a joint statement with nine other Islamist groups accusing anti-Morsi protesters of carrying out acts of vandalism. This is what the remnants of the old regime want to achieve.Please don't call them Liberals or revelutionary forces, they are the just thugs and fascist using liberal's umberala to defame the liberal and secular forces of the country.Elbaradai who cannot win a single municipality seat cannot represent the oppoistion or liberal focres.Remnants and suppoter of the old regime in media & judiciary started a smear compaigne to destablize the democratic process. I don't not agree with nmost of the Morsy policies and this my right to express or protest against these policies but I don't have the right to use violent means and burnt govt or private offices and buildings.It's a vandalism not freedom of speech or freedom of protest. I wonder which western countries are bankrolling the anti-Egypt louts. Whenever you hear secularism, it is a metaphor for destruction of Egyptian sovereignty. All you need to know is that it was the FJP buildings that were torched. Then you will know who the aggressors are. These are thugs not revolutionaries. We had an election. It's over, go back to working for Egypt instead of this Chaos. We need to get rid of all the Mubarak officials still in power esp. in the judiciary. The media also has it's felool but they are fast making themselves irrelevant. The average people in Egypt are not buying it. 81 million Egyptian's rights to functioning society, law and order (both are necessary foundation for democracy) are being denied by these tens or hundreds of thousands of vocal and violent minority. This is a complete injustice, as vast majority of the 81 million Egyptians will never choose statelessness, yet Egypt is thrown into stateless chaos by physical and political violence funded with foreign money. Does anyone really think the US government, namely it's agent the International Republican Institute, really has Egypt's interest over America's own foreign policy agenda?